Hi everyone. It's been a while since I've been able to post any concepts on here because of being busy with school. That being said, this is a project that I have been looking forward to for a while now because this is an open big scale project that I must do for my graphic design class. And you guys get to help me through it and give me lots of feedback! This is the Canadian Baseball League. A fictional baseball league which obviously consists of only Canadian cities. I plan to do 6 teams in the span of my project timeline which goes until April. After that I may add more teams but we are going to start with 6 and see where this goes. I will be designing the logos and uniforms for these teams. As far as cities go, I have them picked out and will reveal them as we go. Without further ado, lets see the league logo! I'd love to hear some feedback on this as I want a great looking identity for the league. I hope you guys are as excited about this project as I am. Great start. That's a beauty logo right there. Get rid of the grey on the letters, none the less pretty great, good job! Here is the logos for the first team! The Halifax Basking Sharks. I have always thought that this was an amazing animal and that it would be a great name for a sports team. Since they can be found off the coast of Nova Scotia, I thought it would be a great unique name for the Halifax team. 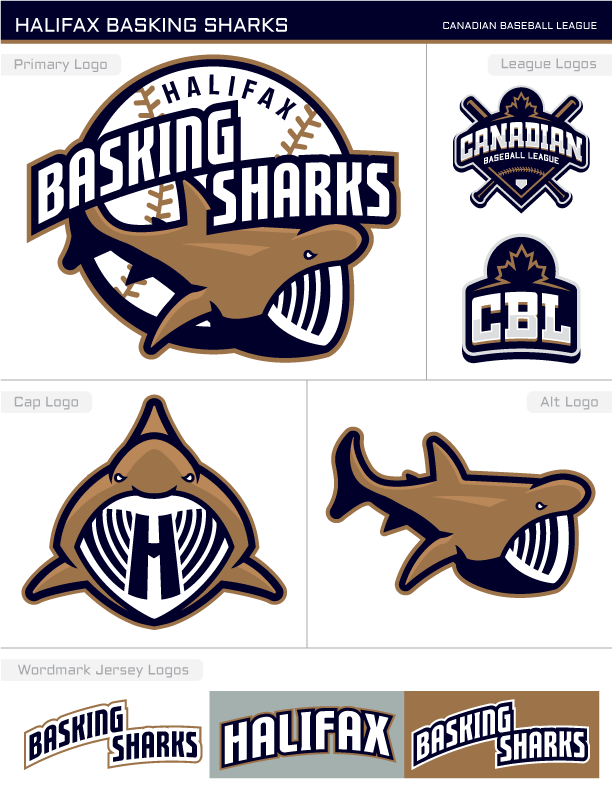 The primary logo features a 3/4 view of a basking shark inside of a baseball. The cap logo is a front view of a basking shark coming at you with its mouth wide open. There is also an H inside the mouth. Let me know how these turned out. Uniforms soon to come! 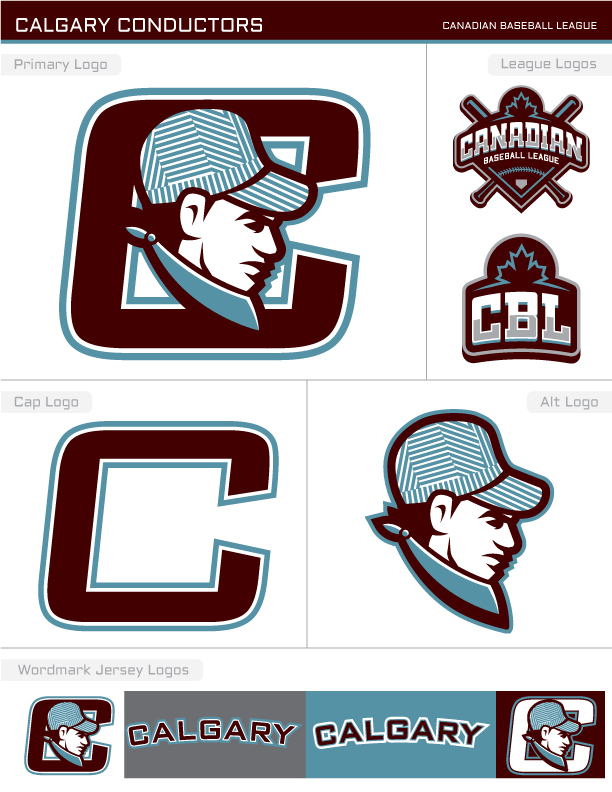 I think it's a tad busy, but the league logo is alright for standalone uses. I think that smaller alternate logo would work really well on the jerseys, though. That idea for Halifax is really cool! The colors are really nice. I love that alternate logo. 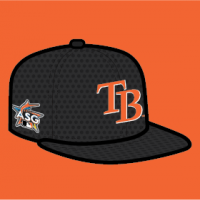 On the other hand, the cap logo feels a bit awkward. If you want a letter logo, maybe you could do an H and shark-tail logo instead? Cool idea here! I look forward to seeing the other cities! Here is an update to Halifax. I agree that the grey muddled the brown color so I switched it to white and I think it is an overall improvement. I also did up some jerseys. The home and road have navy arms with brown stripes on them. 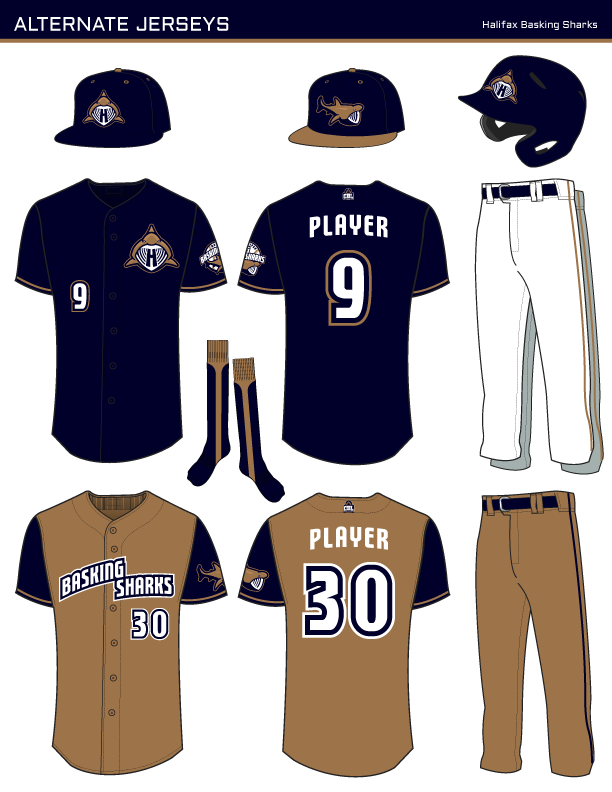 The home alternate is an all brown look that I think would be really unique and would fit the team name. Let me know what you think. So if there's no comments on Halifax then I'll get to the next team. Up next we have the Victoria Spirits. The name comes from the spirits that are represented on Totem poles around Victoria and BC. 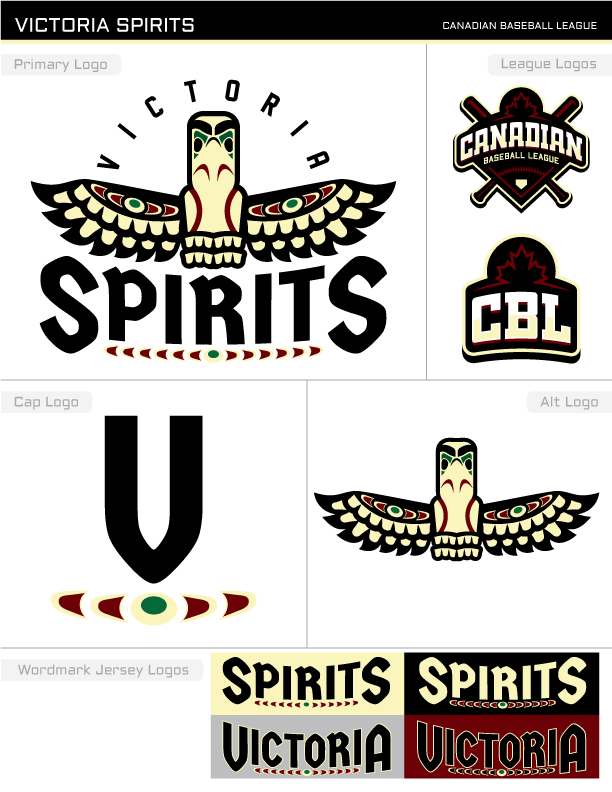 The logo features an eagle totem spirit with a tribe-like font. Also featured in the word mark logos and cap logo is a pattern from the spirit's wings. I think that these look pretty sharp and you can bet that this pattern will show up on the uniforms. Victoria looks awesome! My only nitpicks are to move the wings up to meet the shoulders, and to use a V or a VS monogram as the cap logo instead of an S. You could also try to recolor the wordmark for the red background, since it looks a bit dark. Still, it already is a beautiful look. 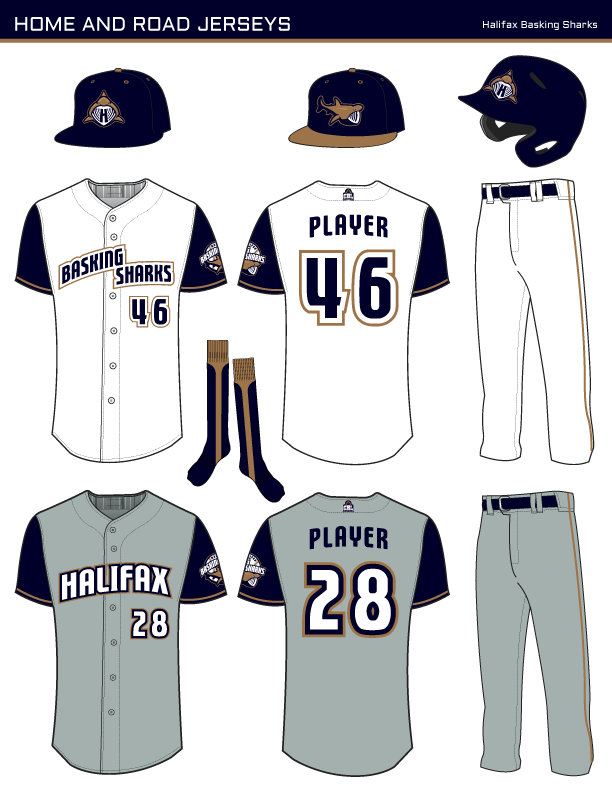 Halifax's uniforms look good; the alternate cap and home wordmark look pretty cool. I'd do blue wordmark, name, number on the away, too. I don’t really like when a logo splits a word apart like that, maybe balancing each word per wing would work? The league logo looks great. Victoria looks great—only thing I’d change is adding a V monogram. Not digging Halifax at all. Hard to make an animal with its mouth wide open show expression. 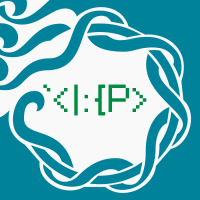 Maybe compromise by making the wordmark a little edgier or at least more interesting. A little update to Victoria. Changed the VICTORIA in the primary logo to be a circle around the spirit. Also changed the S to a V on the cap logo. I tried changing the lettering on the red jersey but I think that the black still works best and that it is pretty much identical to what the Arizona Dbacks wear so I don't think there would be too much of a visibility issue. The jerseys are also here! The home jerseys is unique fore the league as it is cream colored and not white. Also featured is a cream hat. I think that this would look really cool and it would even look great with the black and red alternate jerseys. 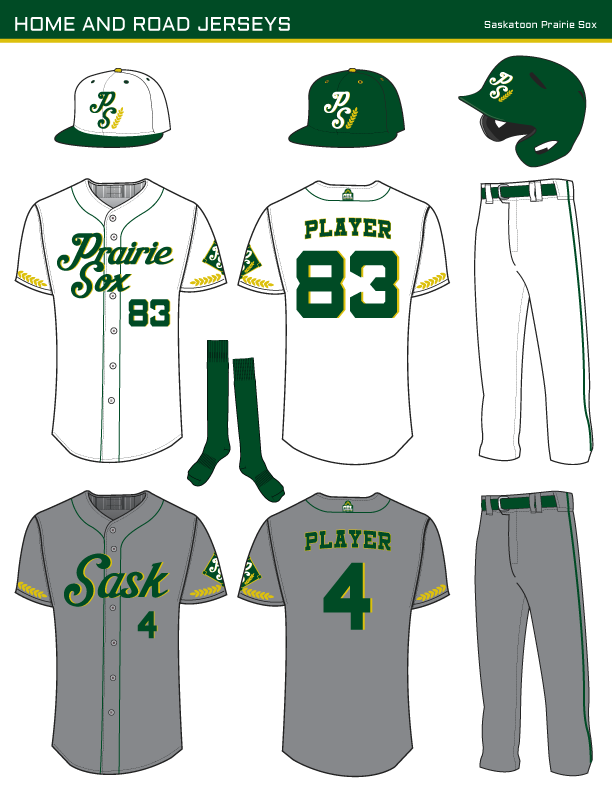 Next team up is the Saskatoon Prairie Sox. 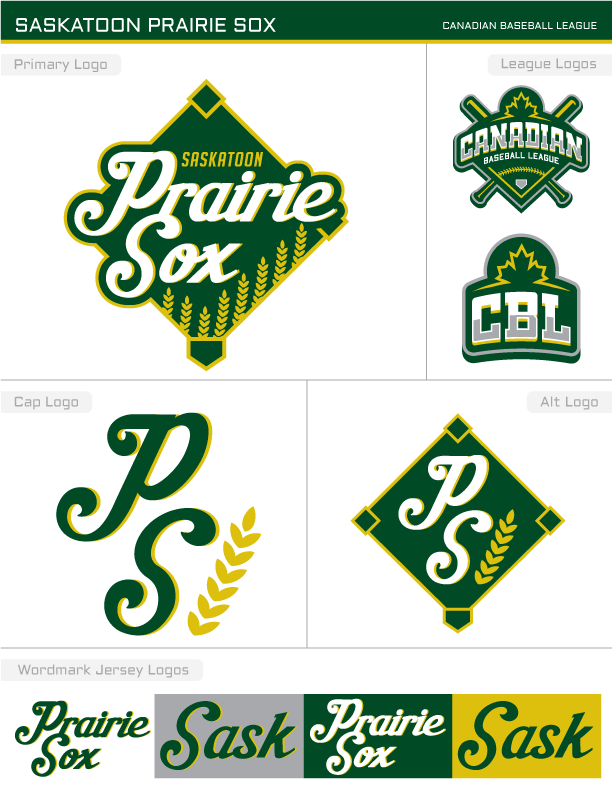 Keeping up with the unique team names, I thought that Prairie Sox would be a great name for a team in the prairie province. It doesn't particularly mean anything but it is similar to teams like the Bowie Baysox and the Colorado Spring Sky Sox. The logo is a diamond shape with script team name and wheat stalks along the bottom. The cap logo is a PS with a wheat stalk beside it. Let me know how this looks. I like the font for Saskatoon, and an abbreviated Sask script seems smart. My only issue is that the cap logo and alt logo feels a bit disjointed. Not sure what the solution is, but maybe consider just using the S for Saskatoon? I think a jersey without white on it could work well here! Great so far! If I had to say, you've gotten better with each one. 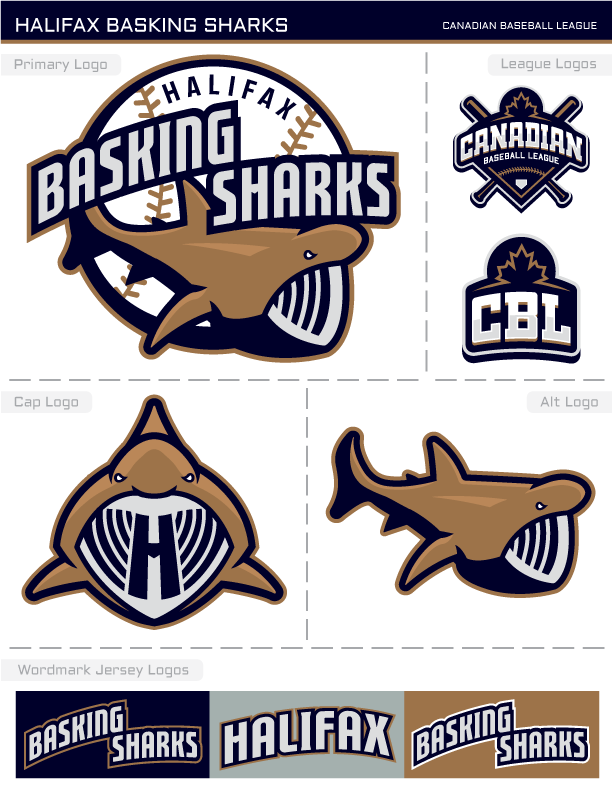 The Basking Sharks one isn't bad, i think the thick white outline is just bugging me when it's used. 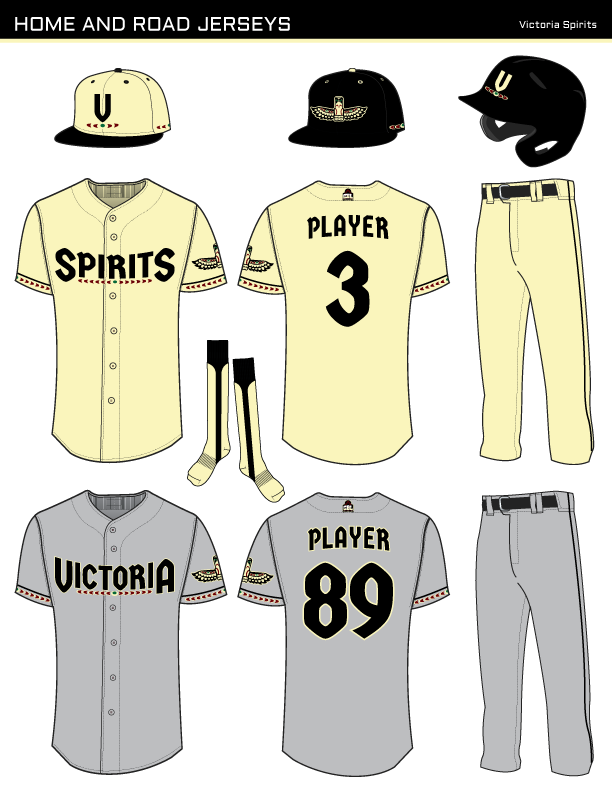 Love the cream Spirits uniforms too! I'm back after a small break with the uniforms for Saskatoon. I tried just the S for a cap logo but I personally still preferred the PS. 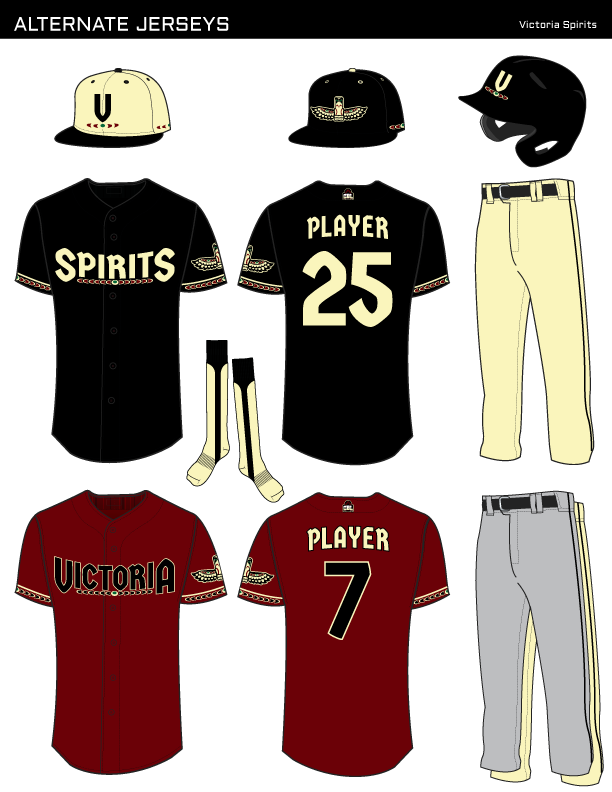 A white cap is included for use with the home and first alternate jersey. The jerseys are the first in the series to feature piping down the front of the jersey and also have a wheat pattern on the arms. 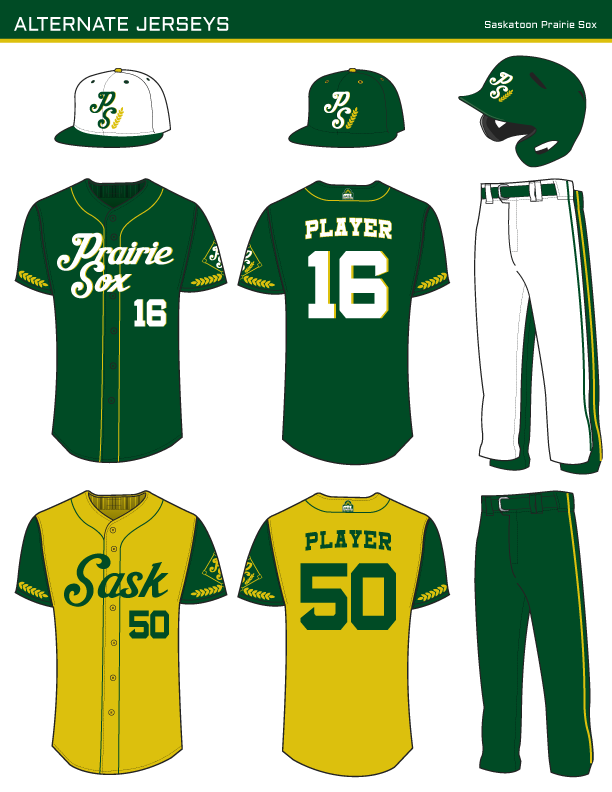 The alternate jerseys feature green pants as an option and the second alternate is completely void of white and just uses Saskatchewan green and yellow. I'm back with another new team. I plan to eventually go back to the Prairie Sox but for now let meet the Calgary Conductors. The name comes from Calgary being the headquarters for the Canadian Pacific Railway. This ties into the brand as the font used for this team is the same as the CPR. The primary features a side view of a old time conductor inside of a C. The logo is simplified to just the C when put on a cap. I decided against a "CONDUCTORS" wordmark as I felt it was too long and that the primary logo would work well on the front of a jersey. Let me know what you think. Looks cool but more like an engineer than a conductor. A conductor is the nerdy guy who punches your ticket.